I have lived in Leadville, CO, at 10,200 feet, for 30 years. The view from my deck looks straight on to Mt. Elbert and Mt. Massive, the two highest mountains in CO. 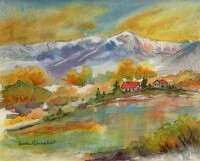 It is the landscape around me and throughout Colorado that inspires my paintings. 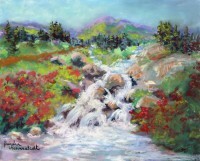 Largely self-taught, I dabbled in painting while my children were growing up, but now in retirement from Nurse Anesthesia and a counseling practice, I am taking advantage of my time to pursue art on a more full time basis. I have taken some workshops in oils, watercolor, and acrylic through the years, and only started pastel painting about 2 years ago.